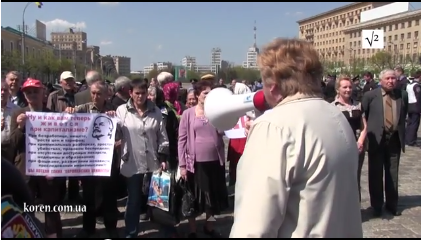 In response, the Kharkiv Communist Party organised a picket of the regional administration on May 28. The rally was attended by around 200 people shouting slogans against the war and in defence of social rights. Soon the police and fascist thugs arrived and demanded the protesters should take down any Communist symbols. In Kyiv the authorities also banned the KPU from holding its traditional May Day parade, according to party secretary Peter Simonenko. They finally announced that they would marching with the Organisation of Veterans of Ukraine. Several far right and neo-nazi forces have already announced that they will physically prevent Communists from marching on May Day. In an ominously threatening way he said: “I think that if the Communists will try anything to demonstrate, the public outrage will stop them. I think that this will involve not only the Svoboda, but all the Ukrainians, who understand that today the Communists are working in favor of Russia, and during the war, in fact, are traitors to the state, “- said Mohnik”. His fellow party member, and former MP Igor Miroshnichenko (who led the assault against the head of Ukrainian TV a year ago), added that “the actions of the Communist Party in the country must not only be banned, we must prevent by any means their presence in the public space.” “The Communist Party – is an accomplice of the separatists. … I believe that the Communists have no legal or moral right to hold their banners. We will follow them up. And if there are any ukrainophobic manifestations, we clearly will prevent them. We can do it without thinking about it, whether we have the support the authorities or not “- said Miroshnichenko” to Apostrophe. Representatives of the neo-Nazi “Right Sector” have declared that they do not intend to let the Communists even take to the streets with their symbols. “Our patriotic force will not allow people with communist symbols to roam around Kiev. Anyone with the flags of the Communist Party will not allow to walk more than two meters, they will not pass. And other left-wing anti-Ukrainian forces will also be repelled. The Right Sector – “Stepan Bandera Tryzub” “will protect the honour and dignity of the Ukrainian people by all available means and methods “, – said Right Sector Artem Skoropadsky to Apostrophe. In the last few weeks, the legal harassment against the KPU has intensified. The party’s secretary Peter Simonenko has been called to give testimony to the Internal Security Service (SBU) several times. The SBU has declared that it has discovered a “terrorist” cell in the Dnipropetrovsk organisation of the KPU, aimed at aiding the “separatists”. Finally, Minister of Justice Pavel Petrenko declared on April 29 that on the basis of the recently passed laws against Communist symbols, the party should change its symbols and charter or be automatically disbanded. This entry was posted in News and tagged Communist Party, KPU, May Day, Simonenko. Bookmark the permalink.